Did you know the most underutilized asset in your business? It’s yourself. Michael Katz shares how to be more likable by having the courage to just be yourself to truly unlock your potential. 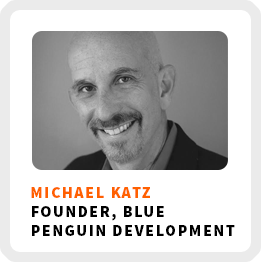 Michael is the founder and chief penguin at Blue Penguin Development. He describes himself as a marketing coach who helps solopreneurs clearly to share what it is they do. He started working for himself in 2000 after following the rules for 40 years. He recently wrote The Likeable Expert about ways to address the challenges of independent workers. How he used a demotion strategy as he transitioned from employment into self-employment. Giving yourself permission to work on your own schedule and take breaks. When you feel like a fraud, why it makes you feel less like yourself. The importance of having a supportive spouse. Why he didn’t take a vacation for 10 years and it’s not because he was working too much. Ideal work environment: Out of the house, with control over the environment – such as his specific keyboard. Sometimes, it’s outside of the office, like in a Starbucks. Superpower: Writing conversational short-format pieces. Definition of success: Getting paid what you really like to do and are good at, in a lifestyle that feels good. 90-day goal: Successfully launching a joint-venture with a partner. 1) Start with the materials you create, like your website and your emails. 2) Read your writing out loud to see if you sound like yourself. 3) Don’t be afraid to use smiley faces or personal stories – if it feels right and true to your voice, go for it.